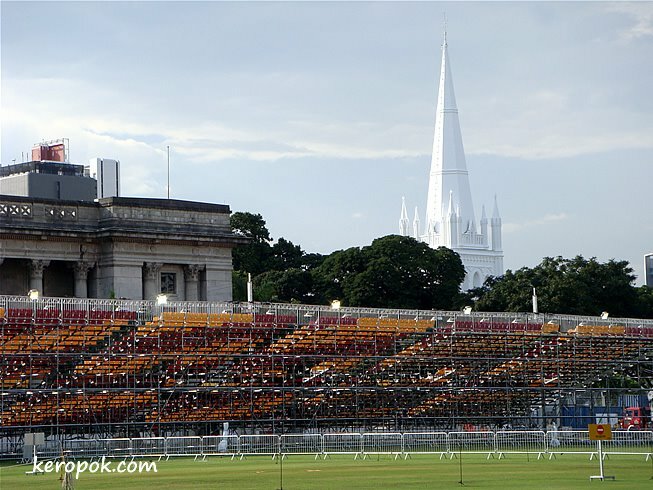 Behind you see the newly painted St Andrew's Cathedral, it's beautiful isn't it? The new paint on the church is white and clean looking. The fascinating thing about this photo is the seats or whatever it is in the foreground. The Cathedral looks stunning. It looks like it has come down from heaven! That is an insane amount of money to spend on blurry cars and all that noise! It is. They have a new huge underground sanctuary too. The banks are sponsoring many of their big clients to flight and accommodation in too. It is beautiful. The cathedral is so white that it almost looks like a ghost on that almost white sky. Great effect. Oh... I did not know that. Thanks for the update.